Thanks for all your patronage and support during our Sushi Train Day. It was a huge success. Due to the great number of customers at all stores on the day, we would like to thank each one of you for your patience. We hope that you will continue to support Sushi Train. 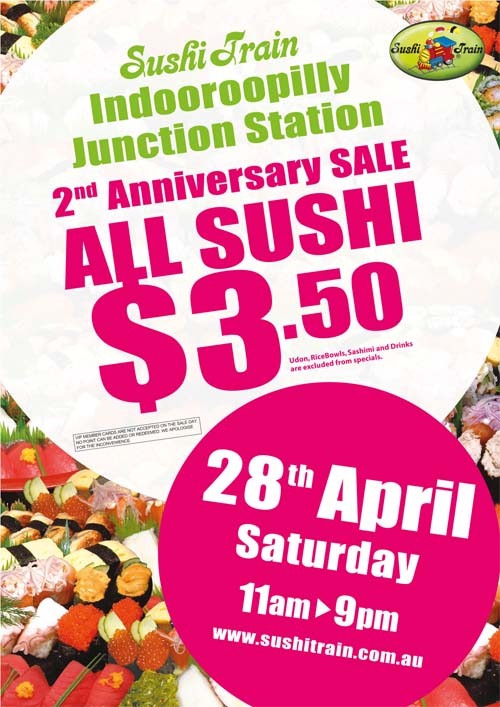 Sushi Train Day ALL Sushi $2 Sale!!!!!!!!! *Udon, Rice Bowls, Sashimi and Drinks are excluded from specials. VIP member cards are not accepted on the sale day. No point can be added or redeemed. We apologise for the inconvenience. 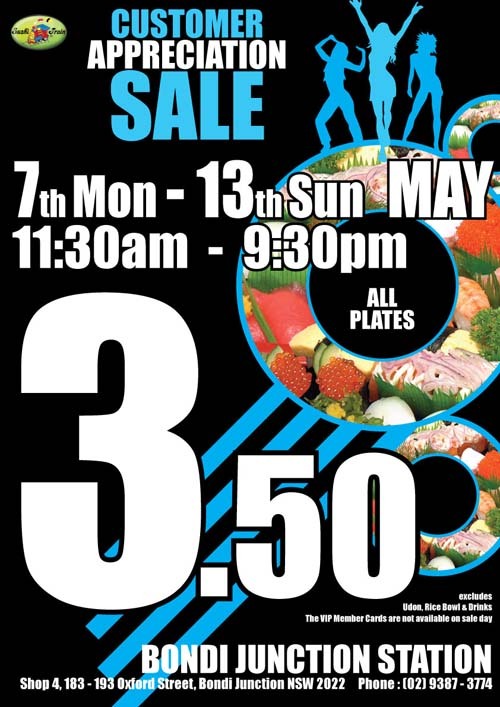 A filming of The Biggest Loser is to take place at the Sushi Train Neutral Bay in the morning on Friday 27th January 2012, and the shop will trade from 3PM that day. We apologize for any inconvenience this may cause. Management of the Sushi Train Neutral Bay. The Sushi Train Central Market, Welland Plaza in SA and Sushi Train Springwood in QLD are to be closed on Thursday, 26 January, due to the minor shop maintenance. Management of the Sushi Train Central Market, Welland Plaza and Springwood.